Kale is very frost tolerant. These 8 frost resistant vegetables are perfect for your fall garden or for an early spring planting. Frost resistant is more accurately described as frost tolerant, which means that these veggies will still be fine after a frost, but may not necessarily withstand a hard freeze. In many cases, a light frost will actually improve the flavor of the vegetable. Broccoli can be planted as early as six weeks before the first frost-free date, but it does best as a fall garden crop. Young plants should be hardened off before transplanting into your garden. Broccoli can tolerate temperatures from 26 to 31 degrees. Brussels sprouts do so well in the cold that they are often harvested well into winter. This is one vegetable that improves in flavor when exposed to cold temperatures. Frosts will actually increase the sugar content, effectively eliminating the bitter taste so often experienced in summer sprouts. Cabbage likes cool temperatures as low as 26 degrees depending on the variety. In fact, you will find they do best in cool fall weather and are rather disappointing in a summer garden. However, if you start them early enough, you can still get a crop before the weather gets too hot. A light frost is thought to improve the sweetness of cabbages. Watch for insects such as cabbage lopers who also like to munch on sweet cabbage plants. Kale can withstand temperatures as low as 10 degrees and is also noted for improved sweetness after frost. 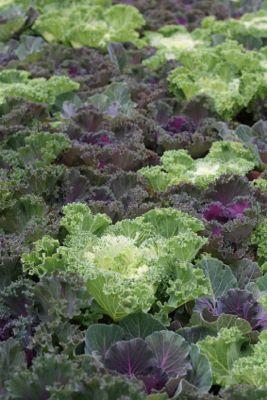 A very hardy vegetable, kale not only tolerates the cold, but it has no problems with insects like cabbage can have. Kohlrabi does not like hot summer temperatures at all, but cool weather is rewarded with delicious, sweet bulbs that are wonderful raw or cooked. Transplants can be put out six weeks before frost with an expected harvest in only a few short weeks. Harvest young, about two inches or so in diameter. You can also cook the leaves. Peas are one of the earliest crops to harvest in the spring. They can tolerate light frosts with temperatures from 31 to 33 degrees. They can be planted from seed four to six weeks before the last expected frost date in your area. Water well and provide something for the vines to climb once they emerge. Spinach does very well in cold weather and can tolerate temperatures as low as 20 degrees. It can also be an early spring crop if you grow under a row cover or cold frame to protect it from extremes. Late season seedlings can be mulched heavily for the winter when temperatures reach freezing for a nice spring crop. Turnips are another vegetable that improves in flavor with a frost. They can be planted in very early spring or late into fall in southern climates. The top leaves will die back if temperatures drop below 10 degrees or so, but the root itself will still be good to eat. As long as the ground is still workable, you can continue to harvest turnip roots. In general, brassica crops are tolerant to frost. This includes broccoli and cabbage as well as cauliflower and radishes. Lettuce is another vegetable that performs best in cool weather. Whichever type of vegetables you choose to plant, be sure to look at the directions on the seed packet or plant tag. These directions will guide you so the particular variety you have chosen will do its best. Just because you have a vegetable that is considered frost tolerant doesn't mean all varieties of that vegetable can withstand the same temperatures. It is important to note planting times and days to maturity in relation to your frost dates.